I'm a writer from a small town in the USA, living in Burma with my husband and daughter. I blog about transitioning to a new country, expat parenting, and my passions: writing and art. 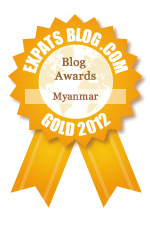 ExpatsBlog.com Expat Blog Awards 2012: Myanmar Gold Award! This blog won the Gold Award for best expat blog in Myanmar! Becky, has made me want to travel to Myanmar.... From the smallest detail of travel woes, to the thrill of going by taxis, to ATM's, Becky has magically and effectively been a Ambassador for Myanmar (Burma). No travel magazine/ tv channel or general information sites have brought Myanmar to me like Becky. She deserves the Top Blog. Becky in Burma is a great read. It's full of information and personality, that mix of personal and reality of living in a completely new environment is a must when I read an expat blog and as well as being fun to find out what living in Burma is like through Becky's storytelling and photos the thing I really love is the fact that there is so much info for everyone! As an ex-pat myself (living in Germany) I can relate to the posts (love Top tips - settling into a new country) sound advice and great reading from a top blog! First of all, the title is enough to make you stop and take notice - Becky in Burma! I love reading about Burma through here - and since it has been in the news lately, I felt like an insider while listening to NPR - patting myself on the shoulder - I know someone in Myanmar/Burma! Because of Becky, I discovered this blog - and while not an ex-pat, I know a few - and I love seeing how people connect. Becky deserves the Top Blog in my book! The inspiring words and gorgeous pictures of this lovely lady make you see Burma, and the world, in a new and authentic way! Without a doubt she deserves the Top Blog award! I love this blog! There are always interesting stories. I enjoyed reading the ATM post about how they didn't have ATM s and now they do. Such inside into another culture really gives the reader a seance of being there. The feeling of Myanmar and her excellent writing make this blog a well worth while read. Plus there is something for everyone, from parenting to art and holidays, political and cultural posts. Top blog is the vote from me! Becky definitely deserves this Blog Award. Love the way she captures the expat life ... from the glimpses of her life told through amazing photos to her wonderfully, written words telling her story of living in Myanmar. She always leaves me smiling at the end of her posts. Every single post that Becky has written that I have had the pleasure of reading has captivated my attention from beginning to end. Across the world from me she shares through her eyes and words what her life is like in Burma. It feels like I am right there, she does such an amazing job with telling her stories. Without a doubt, Becky deserves the Top Blog Award! Becky is a true inspiration! Her words are honest and stories true. She makes you want to travel to Myanmar and to have the bravery to travel beyond. I've always been interested in the cultures of that part of the world and Becky shares her experiences openly. I always love seeing what's new with her every week on the other side of the world! Becky's stories are rich and varied, teaching me much about the life of an expat and the beautiful country of Myanmar. I am fascinated by her accounts of everyday life in a land so different from my own. Becky's writing is clear and engaging, employing beautiful images to help bring her life words to life. Becky in Burma is definitely a top blog! I enjoy visiting Burma from New York through Becky's wonderful posts. Her stories are detailed and informative and the photography is absolutely fabulous. I know more about Burma than I'd ever know from the news or history books, because of Becky's blog. Love Becky in Burma! She makes you feel like she's your neighbor....in Burma! Interesting and relateable! One of my favorite blogs to read! Becky in Burma makes you feel like you're there, struggling with all the challenges of living in another country along with all the little victories, too. Each post is an engaging read and visual delight that I look forward to. As a hopefully future expat Becky's blog gives me a sense that it is exactly the adventure I hope it will be! I love this blog! Becky has a knack for brining you right into her daily life in Burma. So interesting to get her perspective - especially as a fellow mama. I can only imagine the challenges she faces, but she does it with such grace it's a pleasure to read. Becky brings her experiences with such honesty and heart! Her ex-pat experiences make me stop and consider life. Her choices of thought provoking experiences always make me smile, warm my heart, and help me to consider life . . . in another life! I love Becky's blog - her writing style, insights and humility are inspirational and refreshing. She talks openly and with enormous respect about this amazing country and has a great deal of knowledge and advice for expats. I learn so many new things from her, and I have been here approaching four years!! Great work Becky - keep on blogging!! Becky,Becky,you are the person I want standing tall with a smile and a wave when my wary American self steps off the bus in Myanmar!! Excellent job in sharing daily life, along with special events, in a writing style that hangs onto the reader. Beautiful person living life to the fullest and sending back the interesting details! I love, love, love Becky's blog! It's so interesting to hear about her adventures overseas, and so fun to read about her sweet family. She is a fabulous writer and fantastic photographer! She definitely deserves the Top Blog award!! Becky, you are truly an inspiration to me. I envy your tenacity. I want to travel to Myanmar in a year, not only to see the places you have described, but to see you personally and have you invite me into your world, so far from home. More than you can imagine,I want to be part of that world. I am grateful there are people like you who bring this vast world into our homes through your magical writing. Thank you, Becky. I love reading Becky in Burma. I love her photos and it's like I'm in Burma with her. I'm soooo looking forward to her Inspiration Series! I love "Becky in Burma" because I am transported back to Myanmar, not only to Myanmar but to Becky's life. It's nice to know that there are people on the same situation that we are. By reading Becky's blog we learn not just about Burma but about expat parenting, about writing and a lot of interesting things she has to say. I love Becky's blog. I have never been to Myanmar but with Becky's writing and pictures I feel as if I have, she brings it all to life for me. One day I hope to visit Myanmar and I doubt I would have even thought of it before I read "Becky in Burma". Becky in Burma is a fabulous blog! Her wonderful personality and beautiful images allow her experiences to shine all over the world. Becky DEFINITELY deserves the Top Blog award!!!! Reading Becky in Burma is like getting a long awaited letter from a close friend. She writes from a place of raw honesty eliciting both knowing chuckles and sympathetic tears. Love this blog and will continue reading it as long as Becky continues writing! Becky, I so enjoy your blog! Not only can I picture everything I am reading, but I also feel like I am part of it! I also adore the fun fonts and photos you use in your blog! Your blog has helped me from not knowing much about Myanmar to wanting to visit! Thank you Becky! I believe this blog is the winner! Becky in Burma's Blog Bursts with Blooming Bits of Beguiling Business! : ) (Could not resist!) This blog TOTALLY has what it takes to WIN your Expats in Myanmar Blog Award! Becky's blog has information that is extremely beneficial to people in all walks of life! I am not an Expat (if I am saying that correctly) but I still benefit from the excellent Expat Resource and Expat Kids Resources pages on her blog! : ) As a hopeful writer I love to read her blog and also love her resource page for writers. Becky has a Big Heart that shows in her writing and also through the fact that she shares all of her amazing experiences, artworks, and resources with her readers. I just sent her blog link to a friend that is raising her family overseas and I know they will love it and benefit from it too! I am so thankful to get to know Becky through her blog. Becky's blog is outstanding...full of feeling, humor and honesty. Becky's blog is an inspiration: every time I read it I feel more and more inspired and empowered to follow my dream of moving to SE Asia! I love Becky in Burma!! Her style of writing and personality make me want to visit Burma. Great blog! Living vicariously through Becky in Burma! Keep making me laugh and think and laugh again. You are a gem! Hats off to Becky for bringing Myanmar to us at such a riveting moment in the country's history. We've had the news coverage but she shows the country to us at a more human level. I love this blog. Is light and deep at the same time. It gives insightful glances on the context without intruding or pretending to have answers. Personal and delicate as well. Definitely the most entertaining and from-the-heart blog - I absolutely love it and read it as often as possible! Becky is a wonderful writer with real depth and spirit. Her blogs about Burma are by turns funny, heartwarming and bittersweet as she battles cultural differences and talks about her inspirations and frustrations. Reading her posts always make me think and she very acuitively reflects life as an expat in this developing country. Highly recommended! I love Becky in Burma's blog. She has an awesomely interesting range of topics (I can't wait to see more of her Inspiration Interviews), with beautiful photographs and a very admirable cultural sensitivity to her host country. I always look forward to reading Becky's posts and hope to read many more! I am new to Becky's blog but will be reading it a lot from now on. It is a very interesting blog and takes you right into Myanmar. I love her lovely personality, It shines through the photos and writing. In my opinion she should win the award. I love Becky in Burma! Such fun and informative reading. Becky's blog is a valuable insight into the life of an expat in Myanmar, written in a fresh and charming style. I really enjoy her observations and would love to visit the country one day. I love reading Becky in Burma! Becky has a beautiful voice that puts me at ease and makes me feel as if I'm in Burma at Becky's home having a cup of tea with her - which is wonderful because I'm not sure I will make it to Myanmar anytime soon. Becky's blog sure makes me want to visit though! I am grateful for the opportunity to "see" the world through Becky's light-filled eyes. Love this blog!! The amazing lady deserves the Top Blog award! Becky, of Becky in Burma blog, has an effervescent and enlightening voice. The stories and moments she shares make me feel as though she is near to me rather than worlds away and inform me of a culture different than my own. Becky's blog is so much more than a blog about life as an expat in present day, ever-changing Myanmar (Burma). This is born out by the fact that many of her subscribers live elsewhere and have no intention of traveling to Yangon, let alone living here! The entries are informative, witty and sincere. She certainly gets my vote! Becky in Burma is a great blog! I love reading about her experiences in a new, different culture. And she takes/uses such beautiful pictures! Love reading Becky in Burma! I love reading Becky in Burma! She's thoughtful and inspiring! I love reading Becky's blog. It feels as if I am traveling the world with her when I read her beautifully written posts. I have learned so much about Burma and the life of an expat family living abroad. I love checking in with Becky's blog because she balances stories about art and writing with the expat perspective. It's not just about living internationally...it's about having a rich and full life as a woman, parent and artist, all while living internationally. This really is a Great Blog ! and awesome writing style and way of thinking.OK ! so my rating for this blog is 5 Stars !!!!! Becky in Burma is possibly my favorite expat blog, and I read a lot of them! It's informative AND has heart. Becky writes in a way of no other and makes me feel like I'm there. Becky in Burma is a great blog!!! Her wonderful personality shines through in her writing. It is always a pleasure to read!! Great writing, interesting stories and beautiful photos of life and family in another land! Love her blog and read it regularly. A great funny and interesting writer. Thanks Becky! I love Becky in Burma. Her attention to details and the often over-looked daily challenges and adventures of ex-pat life make her work come alive. I've traveled extensively but now also want to visit Myanmar as I learn more about it through Becky's excellent blog! This is definitely award winning material! Becky's blog is the way I vicariously live a "real" life in Myanmar! She writes about the things I care about in a way that is so relatable. It's one of the few blogs I read all the time! Your Name Do you think this blog has what it takes to be listed at the top of Expats in Myanmar Blogs?